Belgian Shepherd Dog (or Belgian Sheepdog) refers to any of these variants of the breed, the Groenendael, the Laekenois, the Tervueren or the Malinois. All are hard-working, intelligent dogs of the same general size and temperament. They differ only in their coats and superficially in appearance. Belgian Shepherds are highly intelligent, alert and sensitive to their sourroundings, and develop a strong bond with their owner. They need significant socializing as puppies, lifelong activity outlets, and will seek to be with "their human" at all times, preferably doing something rather than laying around. They don't like to be left alone and tend to be a "one person dog." Belgian shepherds like to please, and can over-react badly to "negative" (punishment or deterrence based) training, so they should as a rule be clicker- or reward-trained only. They can also behave as if they think that they are smarter than their owners, so it is important for the owner to know how to train dogs or to enroll in training classes. Professional training is highly recommended. 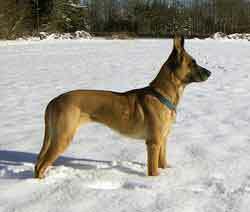 All the Belgian Shepherd breeds need a lot of activity and close interaction with people. Like most herding breeds , they need a job to do. Throwing a toy endlessly for the dog to fetch works for some breeds, but the Belgian breeds are intelligent and sociable dogs who can easily become bored with such simple and undemanding repetition. The males weigh 65 to 75 pounds and are 24-26 inches at the withers. The slightly smaller females weigh 60 to 70 pounds and stand 22-24 inches.